The story starts with this image of the Richelieu & Ontario Navigation Company steamboat CORSICAN, taken by William Notman or one of his associates, of Montreal. It was a popular image, used regularly in the company's promotional efforts. 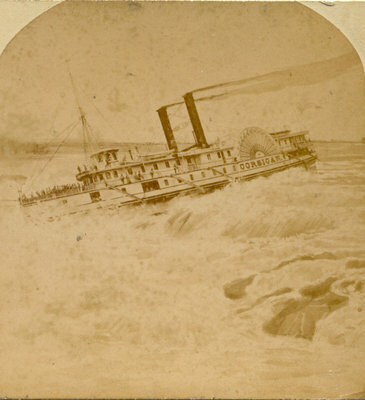 At some point in the proces, James G. Parks, a rival Montreal photographic firm, wanted a stereoview of the MAGNET, by this time also in the Richelieu and Ontario Navigation Company fleet. Rather than shoot a new photograph of the MAGNET in the rapids, the name was inked in over the CORSICAN on the paddlebox (the circular covering of the paddle wheels). In addition, a flag has appeared at the stern. 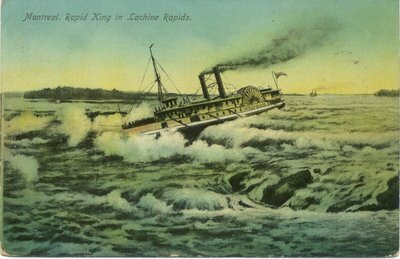 By the time the R & O brought the RAPIDS KING out in 1907, postcards were all the rage. 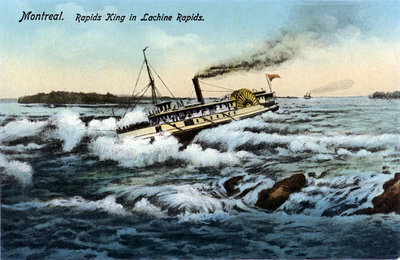 So the thirty-year old image of the CORSICAN was brought out, a coloured version produced and the card titled "Rapid King". Not only did they get the name wrong on the title of the card (Rapid should have been plural), but no one told the artist who replaced the name on the paddlebox with "Whirlpool". 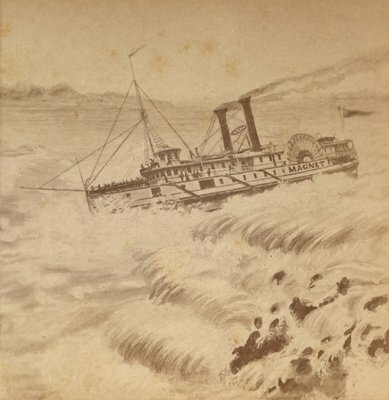 To add insult to injury, the RAPIDS KING didn't have paddle-wheels; she had a propeller. To add drama, a second steamer is in pursuit. No one was going to confuse this with the real CORSICAN, which had been re-named PICTON for the 1905 season, and burnt on the Toronto waterfront in September 1907. ... so the answer? Spell the name correctly on the title. Erase the name on the paddle-box altogether. In the process, they also "corrected" the image by reducing it to only one smoke-stack. Too bad about that propeller. 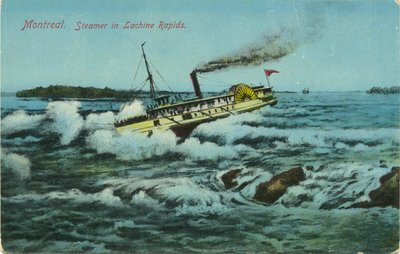 Finally, this has been rendered without any name on the paddlebox, and a generic reference to the "Steamer in the Lachine Rapids". Throughout the thirty plus years that this image exemplified the traveller's experience with the CORSICAN and her line mates, the same captain looked over the rail in front of the pilot house to the same passengers. And since 1907 that second steamer still hadn't caught up.